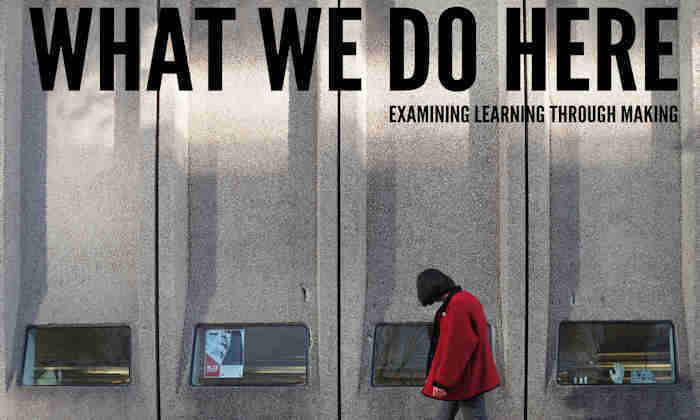 On Friday, 29 June the Venice Biennale saw the premiere screening of What We do Here; a documentary film about the role our modelmaking workshop plays in student and staff learning and development. In the basement of Humanities Bridgeford Street you'll find the B.15 Modelmaking workshop which has served our architecture department since 1970. The long-established workshop introduces students at both undergraduate and postgraduate level to modelmaking as an important design tool. Documentary film makers Kieran Hanson and Howard Walmsley set about recording the plethora of daily happenings in the workshop environment back in September last year. The aim was to explore modelmaking pedagogy for the many students and staff at Manchester School of Architecture which frequent the workshop space. MSA is a joint school across our university and Manchester Metropolitan University giving students the benefits of both campuses. Screening at the prestigious Venice Biennale gave the film the perfect setting. Architecture practice Feilden Clegg Bradley Studios and award-winning furniture maker Hugh Miller presented before the screening which led to a constructive debate on the subject of making in design. The film is now resident at the Time Space Existence exhibition space at the Palazzo Bembo on the famous Grand Canal. Entry is free, and it's expected to attract many visitors across the summer up until the end of November. The completion and promotion of this film and its associated events would not have been possible without the University's Investing in Success scheme which backed the project. The workshop team is currently planning a number of local screenings and UK events that will feature the film in the coming year. If you get a chance to visit, tag @b15workshop #whatwedoheremsa on social media.